Tonight I want to show you a mini canvas. 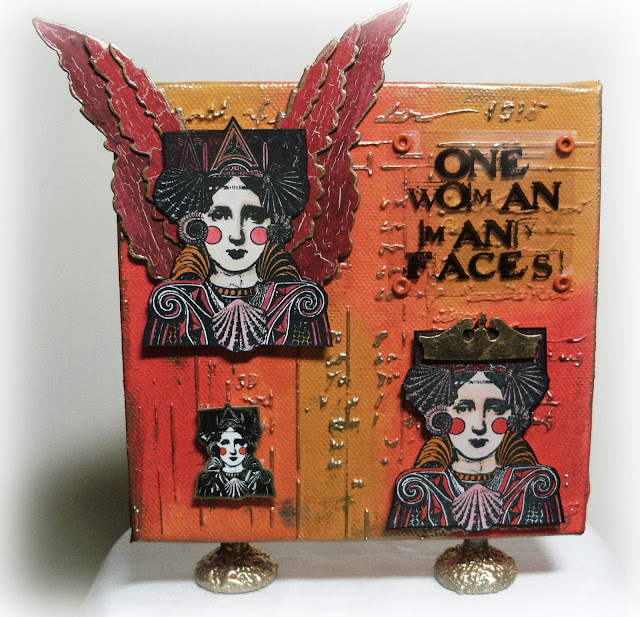 I used one of the PaperArtsy 6 x 6 Box Canvases for this project and these colours. I used the Mini Ledger Stencil and pushed some Grunge Paste through it and left it to dry. The whole canvas was then painted with Nougat. This is an opaque paint and acted as a base for the transluscent colours I had chosen. 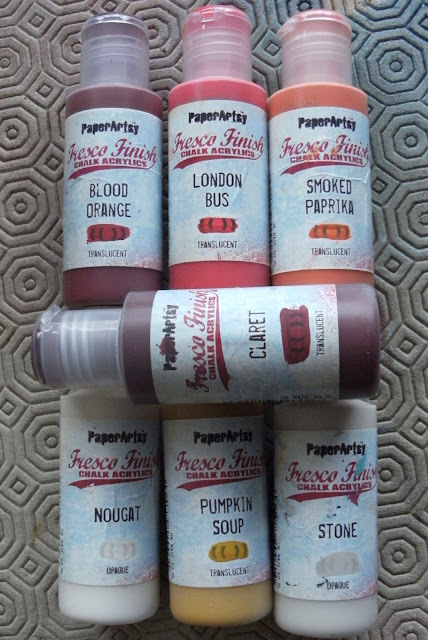 Once dry, I painted the canvas with London Bus, Smoked Paprika and Pumpkin Soup. Although I pretty much dried one colour before changing to another, I managed to blur the edges of each colour by having a wet brush brush and brushing the area where the colours changed to combine them. 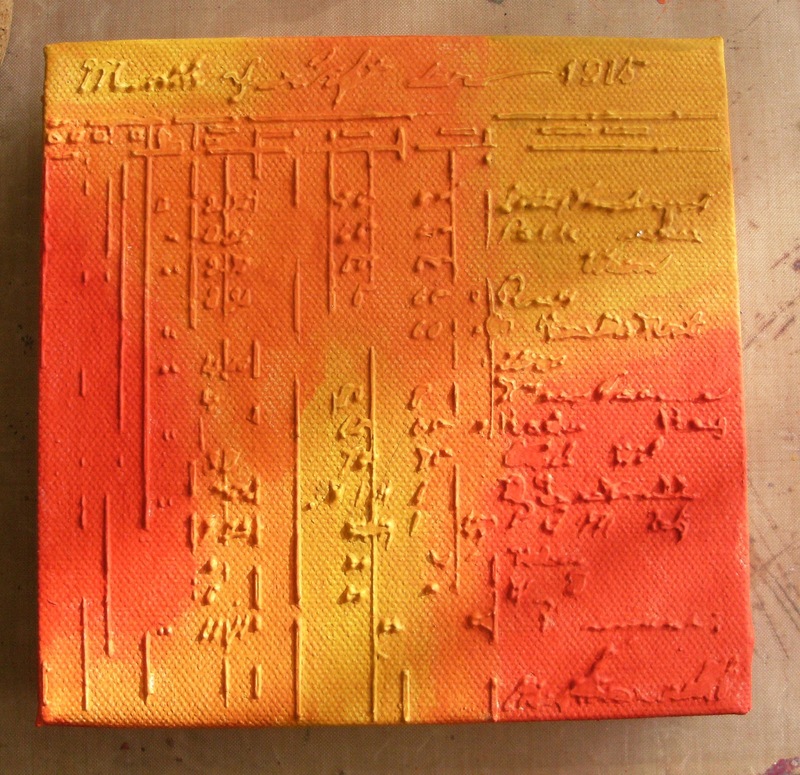 I also used the Mini Harlequin Stencil on the sides of the canvas. At this point the cat decided to pay me a visit! I decided to decorate the 2 sides with the key stamp from LPCO13 – a lovely detailed key. 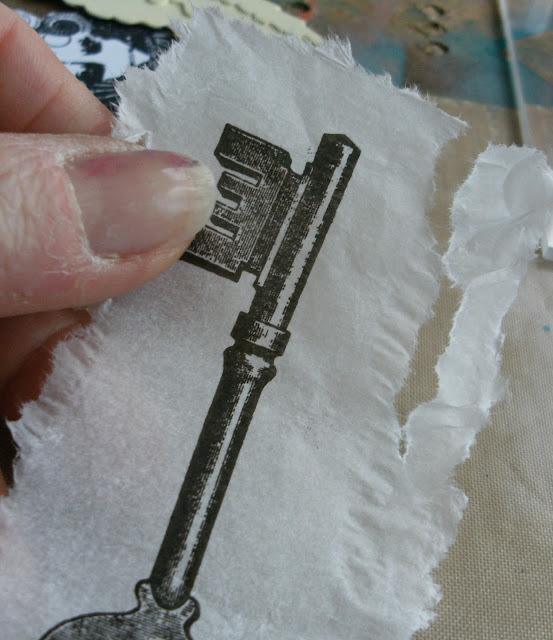 Applying keys: I stamped the keys onto tissue paper with Stazon Black. I painted round the image closely with a water laden brush and pulled the tissue to give a frayed edge. I then painted a wash of Fresco Smoked Paprika on the reverse side. Smoked Paprika is translucent so you will not lose the image. Once dry, I brushed a layer of Fresco Satin Glaze on the back of the key images and applied them to the side of the canvas. It’s the first time I’ve used Satin Glaze and having previously used PVA to apply my tissue stamped images, this is way better and it’s much easier to apply the tissue, leaving you with a smooth image. As Leandra says in her YouTube video (even though she’s referring to Crackly Tissue, it seems to like being picked up and stuck back down as you smooth out any air bubbles. Once the keys were stuck down, I continued painting Smoked Paprika on top of the image and round the edges and eventually you build up enough layers so that you can’t see the edges of your tissue. It doesn’t take long. I tended to water down the paint slightly to make it flow more. It’s amazing how the tissue disappears. I very carefully used a piece of Cut N Dry foam to highlight the stencilling with Liquid Leaf across the front of the canvas. The main image on the canvas is from LPCO01. It was stamped twice on card with Stazon and also on Shrink Plastic. I coloured the card images with pens and gave them a coat of Fresco Satin Glaze which gives a lovely smooth finish. 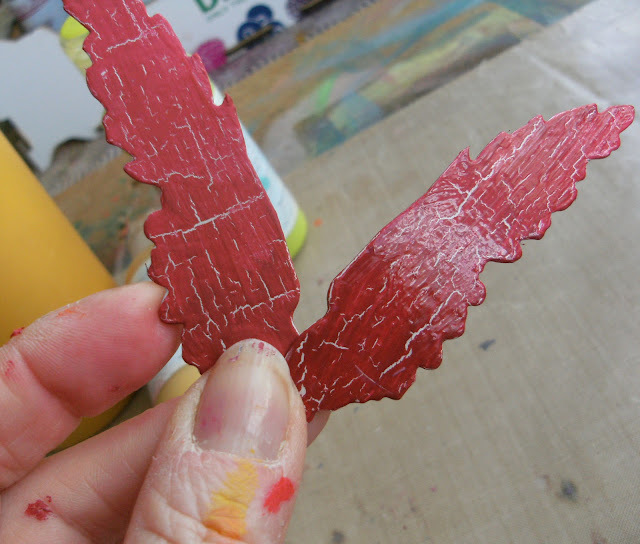 For the top left image, I initially painted the wings (a TH die) with a base coat of Fresco Stone and added a layer of Blood Orange mixed with London Bus to make them quite dark and then I thought – ooh what about a Crackle Glaze. So I started again and re-painted them in stone, added a layer of FrescoCrackle Glaze and then a layer of Blood Orange and London Bus missed together again. It is REALLY important to make sure that each layer is dry before adding the next one because otherwise your crackle won’t work properly. You can use your heat gun to help the drying. I edged the wings with Liquid Leaf. 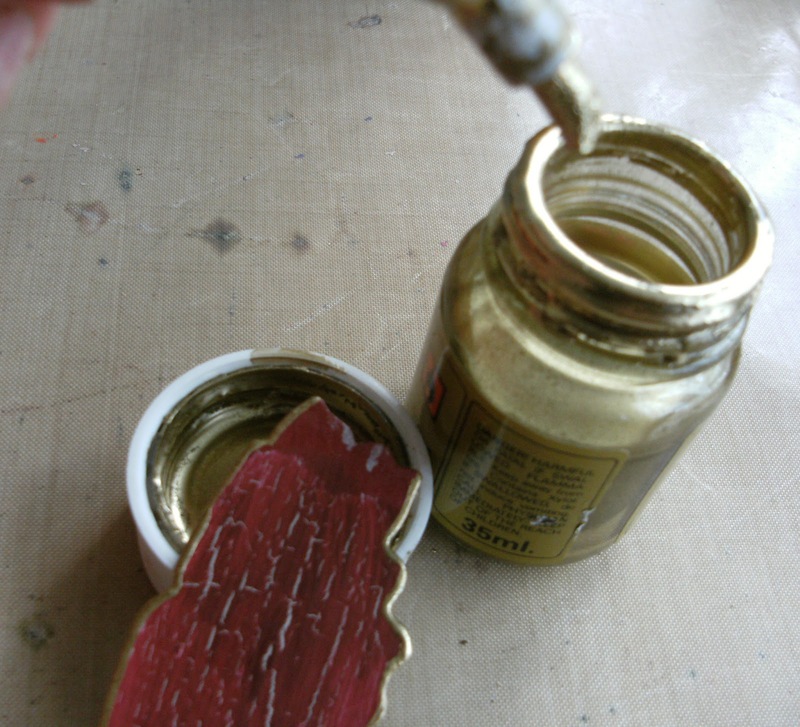 My gold Krylon pen has finally given up the ghost and I’ve found the dipping it into the Liquid Leaf works just as well. The words were printed onto acetate. I couldn’t think how best to apply them to the canvas. As an experiment I put some eyelets through the four corners and carefully dripped some glue through the eyelet holes. It actually caught on the canvas and held in place – sorted! For a change I thought I’d have some feet. Nothing in the stash so I raided the local DIY and bought a couple of stainless steel door knobs. 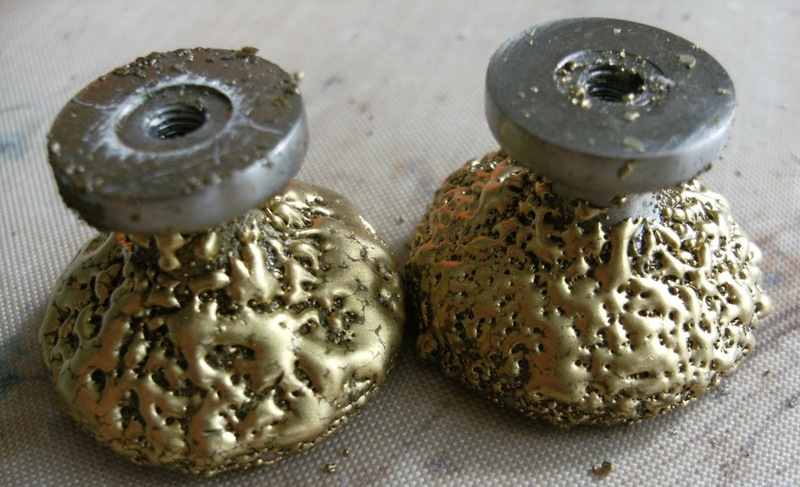 To match the colour scheme of the canvas, I coated them in a mixture of gold embossing powder and gold UTEE. It created this wonderful knobbly texture. I super-glued the doorknobs to the bottom of the canvas but my plan is to get the other half to help me screw them in to secure them more firmly. I hope you have enjoyed the projects this week, I will be back next month with some more PaperArtsy projects. Leandra Says: Well I am totally loving your feet, but Ive got to say, the colour combo is particularly striking! How cool does that ledger look in the background! A fantastic stencil, and superb once accented with the liquid leaf!!! not sure why I don't (yet!) have the ledger stencil, I've loved it every time you've used it this week! Your colours today are beautiful and I totally love this project. Just loving what you have done. looks great. Beautiful,warm colors! 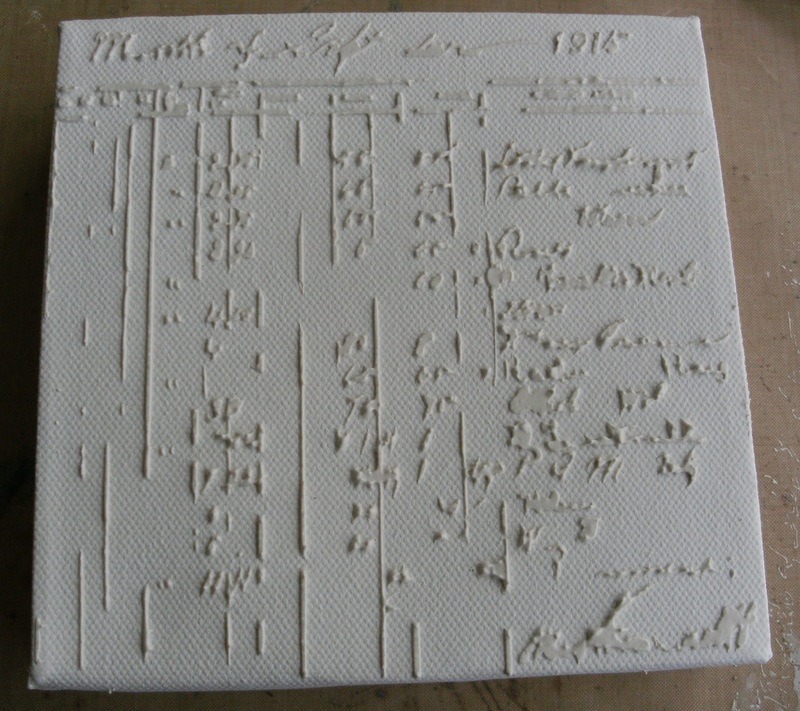 I think I need to put the ledger stencil on my wish list; you've done such great things with it! Awesome! 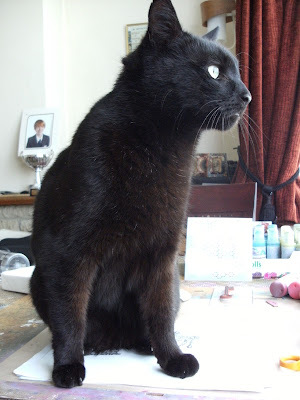 Love the texture with the paint and of course the Handsome regal cat! Beautiful canvas. Love this canvas Carol. The colours are gorgeous..... really hot and beautifully blended. Thanks for the tip about attaching the acetate and using your old Krylon pen for the Liquid Leaf. Totally fab inspiration! Beautiful canvas Carol..the colours are great..go so well together and love what you have done with the stamp..very resourceful use of the door knobs lol!! great piece love it!! Wow Carol, this is fabulous, love the colour combo, the stamps and the stencilling looks fantastic. Have a canvas and a new plate of stamps to play with, so all is good!! Omg, this is gorgeous!!! the colours are beautiful, I love the texture & the feet look amazing. Can't add to what has already been said but I just had to tell you how much I LOVE this! Wow! This is absolutely fabulous. Thanks for the concise instructions and photos. Pinning it for future reference! What an amazing project Carol has produced. Love the texture and colour combination. Really fab. What a fantastic canvas... the gilded wings are brilliant, and I love the gilded ledger in the background too! Beautiful canvas, love the warm colours and the quirky details, the door knobs in particular ! Gorgeous, gorgeous colors...my favs. And the stamp is, too! 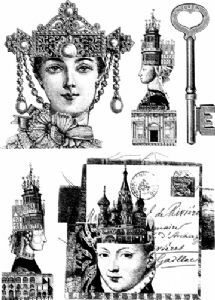 LOVE this pieces! I love to see every single step by step that lead to such a wonderful piece! Of course the furry assistant gave that unique touch!